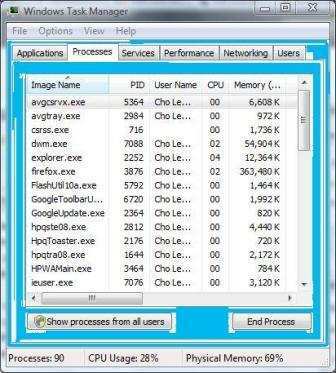 When opening or running Task Manager, the Task Manager top-level menu bar and tabs may be missing and disappeared from its window. Typically, Task Manager has the menu bar which has File, Options, View and Help pull-down options, and various tabs to display and show details on Applications, Processes, Services, Performance, Networking and Users. The problem is now all these menus and tabs are gone missing. Actually, the clean Task Manager with ‘missing tabs and menus’ user interface is not an error nor a bug. 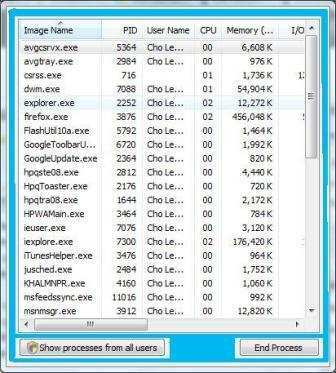 In fact, it’s a feature of Windows Task Manager to run in tiny foot-print compact mode. In compact mode, not only the menu bar and tabs are hidden, the top and bottom window border frames which contains Minimize, Maximize and Quit/Exit buttons and status bar also go into hidden and not visible. In fact, anybody can cause Task Manager to go into small footprint mode by simply double clicking on the empty space around the border and empty space in the border around the tabs of Task Manager. The area to double click to switch to tiny footprint mode is illustrated in the figure below in red color. To revert and restore Task Manager to default full mode and get the menu options, tabs, status bar and other buttons back, just double click on the empty area around the border of Task Manager window again. See illustration below with area in blue for the location to double click.re the red-mark is present).